This is actually one of the worst bad casts I have seen. It is not the worst. I am saving that one. That’s a beauty which you have to see to believe. Back to this bad cast. It is bad. Really bad. What makes it so bad is that it is actually pointless. This is a cast that doesn’t even need to be here. That may sound harsh, but it will make sense soon (plus, it is just a plaster cast, not a pet). So casts of fossils are useful. Even some of the bad ones had a reason. This one, however, baffles me. Why did they…? Who even…? What the …? One of the worst fossil casts in my museum. And truly pointless. Crinoids are beautiful marine animals which have ‘arms’ that float upwards, grabbing their food to bring to their mouth. They have a long ‘stalk’ which attaches them to the marine sediment. Just imagine an upside-down starfish held to the sea floor by a long thin stem out of the sea floor! In fact, that is not really too far off, because Crinoids are closely related to starfish, and belong to the same group, the Echinodermata. The earliest fossils of these creatures have been found in rocks that are very old, around 480 million years ago (during the Ordovician Period). These beautiful animals are still around today. Their vibrant, colourful forms brighten up the seas where they were found. The ancient Crinoids were just as likely to be as colourful as well. Because they are still around today, we know quite a lot about these fossils. The young (larval) stage free float in the water for a few days before settling to the bottom and attaching itself to a hard surface. Here, it will spend the rest of its life, feeding and producing more sperm or eggs. They feed by using their fine feathery arms to filter tiny plankton (tiny organisms that float in the water). This is actually a pretty cool animal. And this fossil cast we are very lucky to own, can tell quite a detailed story, from its origins around 480 million years ago, to floating with the warm currents today. it’s a big shame that it is too terrible to ever bring out and tell that story! Am I being too harsh to say we never even needed this cast? No. Along the Jurassic Coast, in the South West of England (around 2 hours drive from Plymouth), you can find loads of Crinoid fossils which lived around 150 million years ago. We have quite a few very bad ammonites from Lyme Regis, countless belemnites from Dorset and even a fossil crab from Dorset. 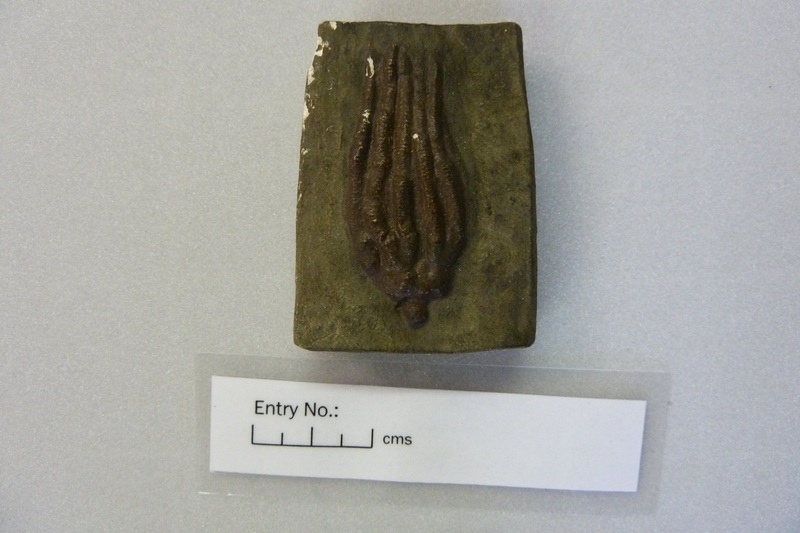 But for some reason we do not have any Crinoids from Dorset! Perhaps this cast was an afterthought. The museum was about to open, and panic set in, we forgot to get a Crinoid fossil to show the diversity of life on Earth. So they ordered a cast. A truly pointless, bad cast. At the time someone was laughing as they made this cast. Little did they realise, that 102 years later a curator would be weeping as he tried with all his might to compliment this cast in his little office under the stairs. And probably failed miserably. 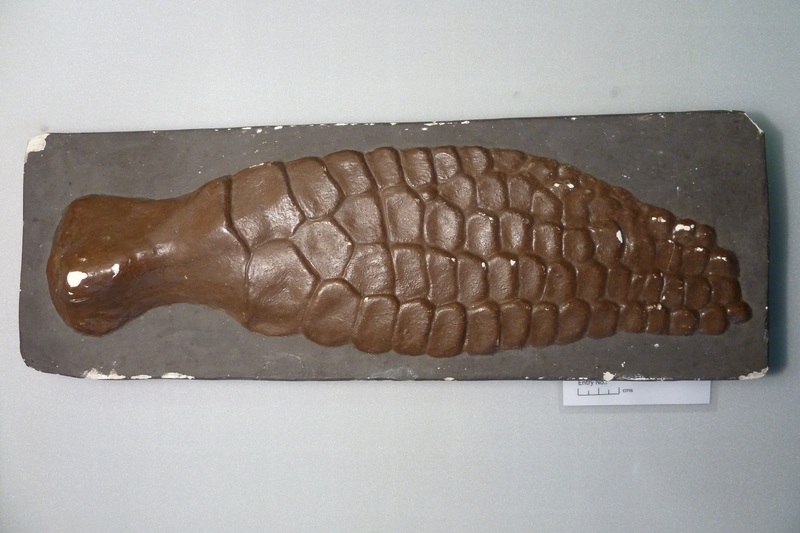 A little cast of a paddle of a big ichthyosaur. A new year. A new bad cast. It looks quite good. But it is not. Not at all. Especially when we remember that this is a reproduction taken from a real fossil. The cast is of a rather perfect paddle (or flipper) of an ichthyosaur. These were enormously successful marine reptiles which were the top predators in the waters while the great dinosaurs were stomping the land. The Order, Ichthyosauria, were on Earth for over 180 million years, spanning the entire Mesozoic Era (which includes, the Triassic, Jurassic and Cretaceous Periods). With long snouts, streamlined bodies and paddles, they superficially resembled dolphins. They would have even swam to the surface to breathe air, just as dolphins and other marine mammals do today. These extinct marine reptiles are an excellent example of convergent evolution; where different animals independently evolve similar adaptations for similar environments. Convergent evolution works with what is already there, so you can’t evolve an ichthyosaur from a mammal, or an ichthyosaur from a dolphin ancestor. These two groups of animals have lots of differences; dolphins are mammals, whereas ichthyosaurs are reptiles; dolphins swim with their backbone up and down, ichthyosaurs swim with theirs side to side; dolphins only have paddles at the front (pectoral fins), ichthyosaurs have both front (pectoral) and back (pelvic) paddles. Ichthyosaurs were an awesome group of reptiles. They evolved into at least 77 genera that have been discovered to date (there are 17 genera of dolphin alive today). Some species were as small as an otter, and others could be enormous; one species was as long as two Double Decker buses! Most of the species had sharp pointy teeth to feed on squid, belemnites and fish. Some had much thicker teeth used to crush shellfish, ammonites and other hard food to feast upon. Others had even bigger, thicker teeth for eating other reptiles. Some actually had no teeth, which was a possible adaptation for suction feeding (sucking in small fish in their short snouts). The strong tail, with a powerful side to side motion, would have been used to push these amazing creatures through the water. The paddles were were for steering the ichthyosaur in the direction it wanted to go. With a smooth streamlined body, the strong tail propelled the big beast through the water, and moving quite fast little tweaks with its paddles to quickly change direction. It would have been a very quick and active swimmer. This cast is a pretty big one; 70cm long. The animal it belonged to must have been a big beast too. Looking at the specimen from the top to bottom of the picture we can see quite a lot quite clearly. The first big bone at the top is the humerus (the bone in our arm that joins our shoulder to our elbow). Moving down the picture, we see two more bones, the radius and ulna (these are the two bones in our arms connecting our elbow to our wrists). We then see some of the wrist and hand bones and then the finger bones. What is lovely about this cast is that it clearly shows how the ones of this reptile have adapted for life in the water. The bones have shrunk over time and one piece of flesh surrounds them to form a paddle. Beautiful. Same bones as you and I, just a little bit different. Specimens as good as this are quite rare. A quick Google search shows a few examples of gorgeous ichthyosaur paddles. They can be found, but not enough of them have been found for each museum in the world to have their own. Enter the cast. We have a few ichthyosaur specimens at Plymouth City Museum and Art Gallery; a couple of vertebrae, a tail, a small specimen folded back on itself, and a paddle. The paddle isn’t good, so it’s quite likely that the museum acquired the cast when it opened a hundred years ago to go along side this real fossil so it was clear what they looked like. A real fossil of an ichthyosaur paddle. 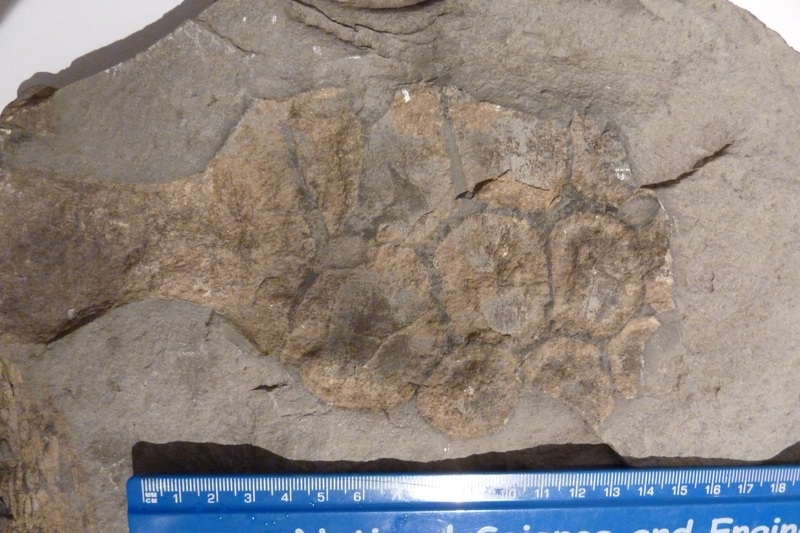 From Lyme Regis, this specimen was purchased when the museum opened in 1910. Not the most perfect specimen, but a beautiful one. Clearly, compared to the real fossil, the cast is dreadful! The cast does tell the story of evolution simply and clearly; it shows how the bones, the same bones in our arms, have evolved to become adapted for steering an ichthyosaur effortlessly and elegantly through water. But, and a really big but, (and to paraphrase those legendary, classical lyrics, I do like big buts and I can not lie); it is a pretty naff cast. It fails to do what casts are really supposed to do. Surely the point of a fossil cast is to create a reproduction of the real specimen so it looks as good as the real thing? Maybe I am missing the point of fossil casts. The cast is simple, lacking the intricate detail in casts we may see today. The finishing touches of paint ‘to bring the cast to life’ fail to do just that. These things make the cast look fake. Of course it is fake, because it is not a real fossil. But a cast should not look so fake. Painting something brown on a grey background unfortunately doesn’t make it look like a fossil. Perhaps tastes have changed in a hundred years, maybe we expect too much. But really? Am I wrong in thinking a few artistic shades of brown may create more of a realistic finish? This cast is bad. It looks fake, and this is where it fails straight away. It’s not as bad as the ghost in the rock, but it is bad. On Sunday 7th November, the small historic town of Totnes in Devon stood still. Quietness floated down the steep Elizabethan high street, where the large crowd of locals stood. A trumpet softly played ‘The Last Post’, while a small flock of pigeons slapped their wings as they flew as one above us. Remembrance Sunday is held on the closest Sunday to the 11th November; the date the First World War ended. It is a time to remember those who have given their lives for their country. Often we are so busy we don’t actually get the time to stop and think. Everyday life is hectic: as hectic as we make it. This is what makes Remembrance Sunday special. For two minutes at 11am people stand in silence together and remember. The two minutes silence is held again on the 11th November. It allows people time to stop and think, and remember. Not only about those brave souls who fought in the First World War, but also the Second World War and all later conflicts. I thought about all those millions of young soldiers who had given their lives; those wives who had lost a husband; those parents who lost a son; those children who lost a parent. I then thought about my grandparents. Both sets escaped the horrors of their home countries in Eastern Europe during the Second World War and travelled, on foot, to Britain. One set of my grandparents actually met each other while fleeing, and married in a beautiful little church in a small village in the Czech Republic. I thought about how I never asked them questions about their lives. I missed the only opportunity to share their memories and now they are lost forever. I then thought about an unknown soldier and a hand full of belemnites with a unique story. Belemnites are not the most exciting looking fossils in museum displays: there isn’t really much sexing up you can do to them. The hard pointy fossils can be found in their hundreds in some places in England. And museums can have more than a few dozen specimens behind the scenes. These little grey-brown, shiny pointy things are generally all that remains of an extinct squid like creature and not much to write home about. Two lovely shiny large belemnites. Not too much to look at on their own. Why do museums bother? Why do museums need so many of these dull looking fossils in their collections? They all look the same; surely one is identical to another? What’s the point; they are utterly uninspiring little things? Unfortunately, these are familiar questions the natural history curator may hear from those who do not understand the importance of natural history collections. And not just about belemnites, but about taxidermy, insects, rocks, skeletons, fossils, and all other specimens. The wonderfully enthusiastic answer would explain that belemnites are incredibly cool extinct squid-like creatures. Most of the time the only fossil we see is the ‘guard’; the hardest part that sits towards the back of the animal and helped it float (which is what you can see in the photo above). There were an enormous amount of species that darted around in the oceans when the dinosaurs were stomping around on the land. We know there were so many species as we can see the different size, girth and even curvature of the fossils. Each individual specimen adds important information about the distribution of these animals and the history of life on Earth. 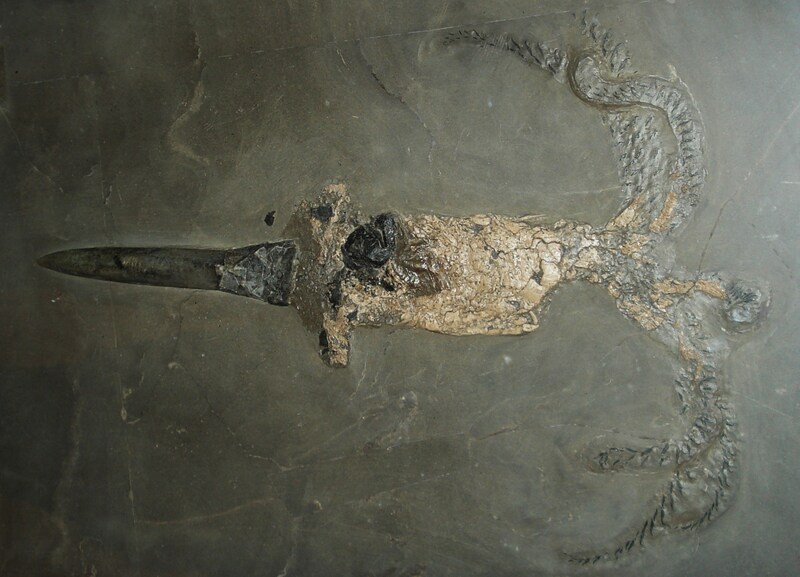 Belemnites belonged to the group that includes squid, cuttlefish and octopus (called Cephalopods). How can we say with certainty that they belonged to this group? Well, very rarely the soft parts of the full creature is preserved. These beautiful, delicate fossils show us the anatomy of the animal in amazing detail, down to the suckers on the tentacles. Incredibly beautiful fossil of the belemnite Passaloteuthis bisulcata. The creature was so well preserved, we can see the detail on it’s tentacles. They are pretty awesome fossils. From that one little smooth calcite fossil we know so much about them. What is even more fascinating, and sometimes forgotten, is the unknown person behind the specimens; the person who collected them, looked after them, and had their own story to tell. 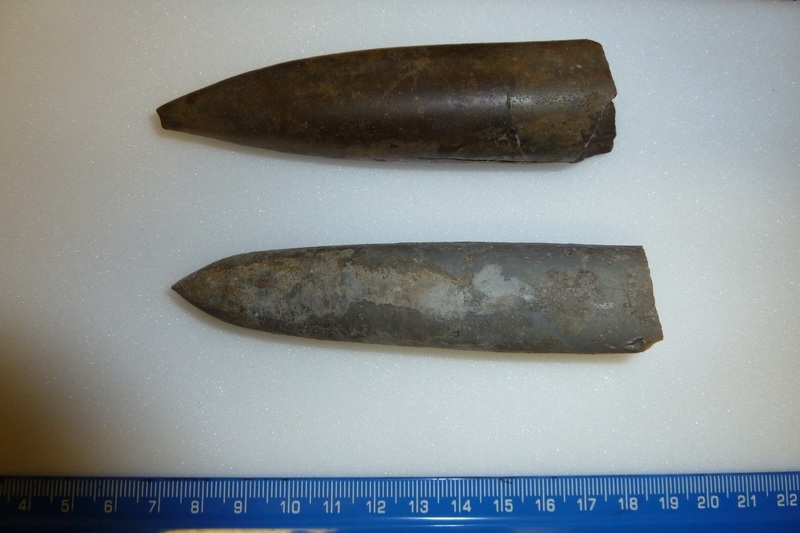 A few years ago a hand full of small, smooth belemnites were donated to the museum. I had forgotten about them. Until I stopped to remember on that Sunday. This small collection may add to our knowledge of the distribution of these creatures around the prehistoric world. There are even likely to be more than one species. But these fossils have a more recent history which adds a completely different dimension to these calcite rods. They were collected in 1944 where a young soldier, a Mr Shearman, was digging trenches in Saint-Lô, Northern France. When I see these fossils, it immediately takes me back to a different world. Not one where these creatures were swimming through the warm water, escaping from the clutches of giant oceanic reptiles. A more recent, more terrifying world. During the Second World War, the small town of Saint-Lô was occupied by Germans. The Allies mounted an invasion on a massive scale to take back German occupied Western Europe. Over 160,000 solders crossed the English Channel on the 6th June 1944. 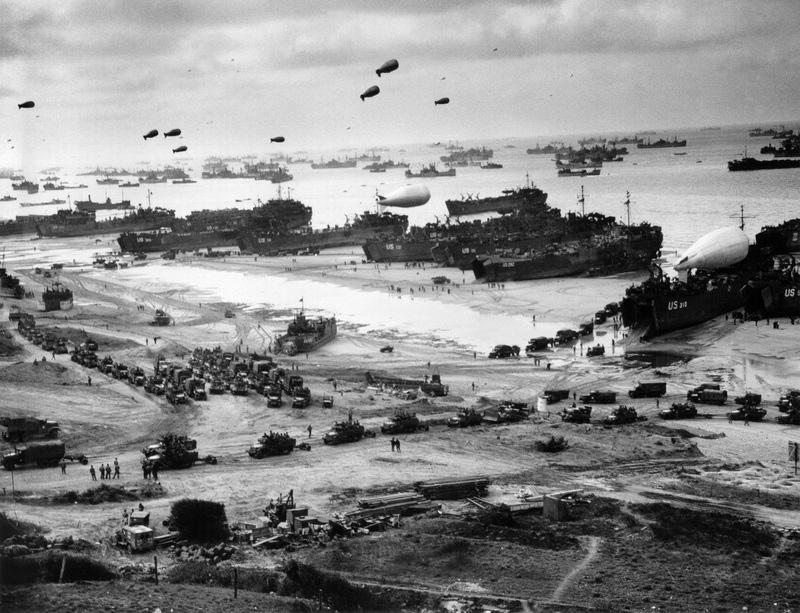 The Battle of Normandy had begun. Just over two months later, the Allies had over 3 million troops in France. To imagine such numbers is absolutely jaw-dropping. The immense scale, and unbelievable realism, in this real photo below is astounding. This was an enormous operation. Soldiers from the UK, US and Canada along with Polish and French freedom-fighters spent over two months pushing the Germans south through France. Five days after Paris was liberated on 25th August 1944, the Germans retreated from France. The Allies swept through cities and towns to free them from German occupancy. One of these towns, Saint-Lô, was severely bombed. 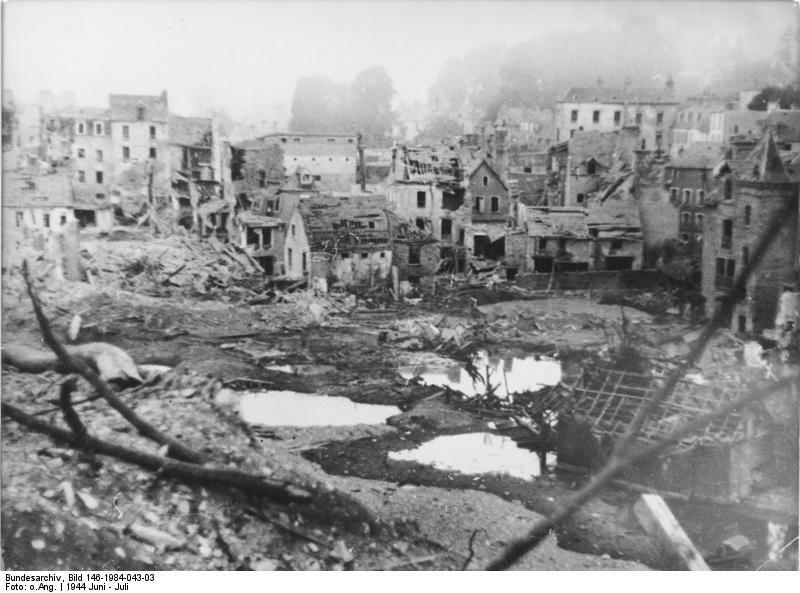 The town was heavily occupied, so several air-strikes destroyed buildings and forced the Germans to leave. Around the town after the bombing, the platoons of Allies set up defences around the town to ensure it was kept out of German hands. It was here where one soldier digging a trench paused and picked out of the soft wet mud these 10 fossils. What made Mr Shearman pick these out while he was digging? What did he feel as he looked at the fossils, the first eyes to look upon them for 200 million years? What were his thoughts as he looked at these hard, smooth pointy stones? Who was Mr Shearman? I don’t know. Perhaps I never will. I do know that this one man stopped amidst the chaos and danger around him to pick up these fossils and put them in his pocket. 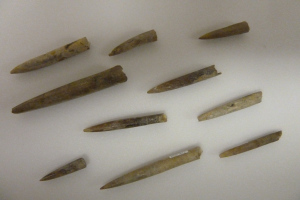 These 10 little belemnites tell us of a time where young men and women saw unbelievable horrors while the world was in a terrifying state. The Battle of Normandy was one of many. Memories, and history, are not passed down through genes. It is learnt and passed down by people. I regret not finding out more about my grandparents memories. They are now lost. My children will never know about their lives because I failed to ask them. Their children will never know. Ad infinitum. Ultimately they will be faded legends. This soldier will not fade away. His 10 belemnites keep his story alive for others to remember the horrible events of the Second World War. He fought in the Battle of Normandy and survived. Something else survived with him, not just 10 fossils, but something that ensures his story is kept alive. Every collection in a museum tells its own story about the individual collectors. And us museum curators make sure that these people, and their stories, are never forgotten.